The French have settled in areas of eastern Canada. 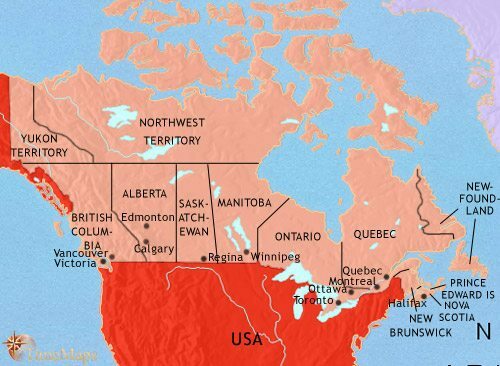 Canada is a part of the British empire. Canadians have a measure of self-government, but would like more! Canada now has complete self-rule under a federal system of government. Canada's population and economy has greatly expanded. Canada now has complete independence from Britain. Two referendums have been held on independence for Quebec. In the 1580s, English and French fishermen set up bases in and around Newfoundland. A little later the French begin building a line of forts and settlements in Nova Scotia and down the St Lawrence river. In 1627, the company of New France was founded. French fur traders have penetrated deep into the interior and, in 1639, the trading post of Sault Ste Marie was established, in the centre of the Great Lakes system. Back east, in the region of Quebec and Montreal, farming settlements spread along the river banks. 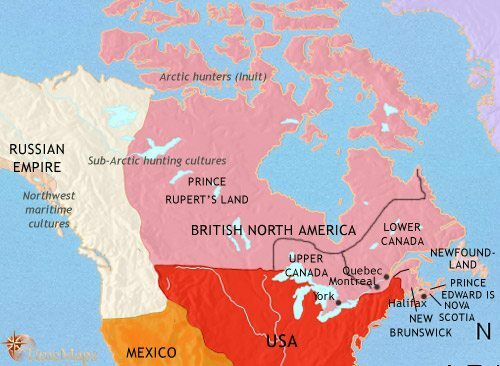 The activities of the French fur traders covered a vast area of northern North America, their push into the interior spurred on by competition from the traders of the British Hudson’s Bay Company (founded 1670), active in northern Canada. To secure their hold over their sphere, the French built a line of forts and trading stations along the Ohio and Mississippi rivers and their tributaries. At the southern end of the Mississippi-Missouri-Ohio watershed they established their colony of New Orleans (founded, 1718). In the east, the wars with Britain led ultimately (1763) to the complete elimination of French power in North America. During, and immediately after, the American War of Independence, thousands of American loyalists settled along the upper St Lawrence, on the east coast and in Nova Scotia. In 1784 the maritime province of New Brunswick was created for the loyalist settlers, who have settled in and around the St John’s River. The increase in the population of Canada, due to the influx of loyalists from the south, led to a reorganization of the country. The Constitutional Act of 1791 created two provinces, Upper and Lower Canada. Both are given representative assemblies to assist the governors. However, popular resentment against the autocratic rule of the British governors, who tend to back the landowners and elites, has been growing, and leads to small rebellions breaking out in both Upper and Lower Canada in 1837. Both are easily put down, but they alert the British government at home to the discontent. 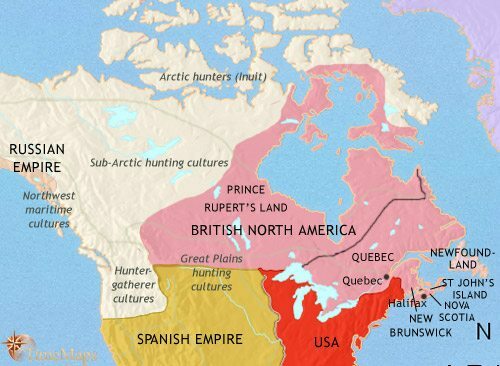 In the west, the traders of the English-speaking Hudson’s Bay Company and French-speaking North West Company have been merged into one company (Hudson’s Bay Company), which controls Prince Rupert’s Land. By this time, trading posts are being established on the Pacific coast. 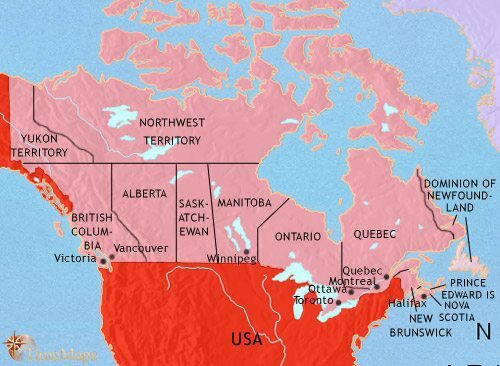 The Treaty of Ghent in 1814 has confirmed the boundaries between USA and British North America in the eastern side of the continent, along the 49th Parallel, but the western frontier is still fuzzy. A British politician, Lord Durham, was sent to Canada to investigate tensions within the country and, as a result, Upper and Lower Canada were united in 1841, and a single parliament elected. In the tussle of party politics, the principle of the subordination of the governor-general to parliament has been established. 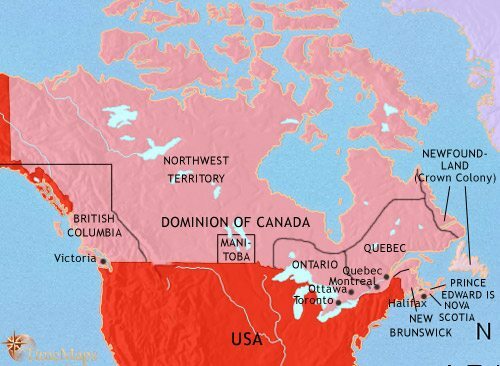 In 1867 the two provinces (now renamed Quebec and Ontario) have united with Nova Scotia and New Brunswick to form the Dominion of Canada. A federal system of government has been established, giving each province a great deal of autonomy. In the meantime, the territories to the Pacific have been opened up. Vancouver was founded as the western base of the Hudson’s Bay Company (1849), and the 1858 Gold Rush in British Columbia stimulated western colonization. 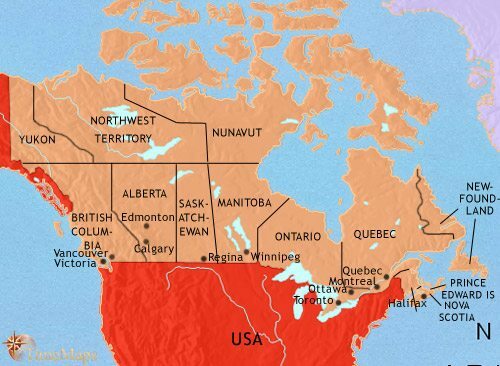 The Canadian government has taken over the lands of the Hudson’s Bay Company (1870), and Manitoba and British Columbia have become provinces in the Dominion (1870 and 1871 respectively). The North West Territory has also been formed by this date. These have been years of continued westward movement and growing prosperity. The settlement of the prairies was officially encouraged, with immigrants from central Europe coming in in significant numbers. The world-famous Mounted Police were established in 1873 to patrol the north-western territories, and the Canadian-Pacific Railway was completed in 1885. In 1897, the Klondyke Gold Rush brought in thousands of new settlers into the north west. In 1905, Alberta and Saskatchewan became provinces. Canada entered World War 1 in 1914, and her troops played a major part in the fighting. After the war, by the terms of the Statute of Westminster in 1931, Britain’s dominions became sovereign states within the British Commonwealth, of equal status with Britain. They continued to share the British monarch as their head of state. By this time, Canada was experiencing the Great Depression of the 1930s, which, as elsewhere, only really ended with the coming of World War 2. As in World War 1, Canada shared with Britain the burdens of war from beginning to end, and her forces participated in all theatres of the war. Canadian airmen were to be found amongst the RAF airmen in the Battle of Britain, and the Royal Canadian Navy played an invaluable role in keeping the convoy lanes open in the Atlantic. Since the war, Canada has been an integral part of NATO. In 1949, Newfoundland, hitherto an independent member of the British Empire, joined Canada. The last three decades or so of the Twentieth Century are marked by a rising demand for independence for Quebec, leading to two referendums on the issue. In both (1992 and 1995), the proposals for independence are rejected, but the issue remains a live one. Under the terms of the Canada Act of 1982, Britain gave Canada total control over its constitution, including the right to choose its own head of state, should the nation wish to become a republic. In 1999, the new territory of Nunavut is created, in which the Inuit people make up 85% of the population. By this move, the Inuit have acquired a greater voice in Canadian politics. Canada has continued to advance economically, and has remained one of the richest countries of the world.